Believing there was a better way to build a ski, George Gaines pitched his idea for a business before a roomful of judges and potential clients last year at the University of Montana. Competing in the John Ruffatto Business Startup Challenge, Gaines used his 60 seconds to argue that today’s established ski brands lack the environmental awareness that serves as a requirement for any self-respecting outdoor enthusiast. 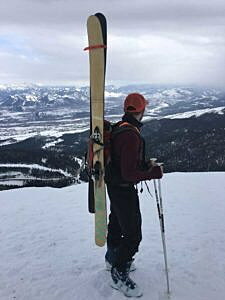 “Right here in Missoula, Chilton mindfully handcrafts backcountry, all-mountain-capable skis with locally salvaged and industry standard composite materials,” Gaines said that night, referring to his startup business, Chilton Skis. The pitch worked, placing Gaines third in a competitive field that saw 16 entrepreneurs sell their own business concept. Nearly a year later, Gaines is ready to launch a Kickstarter campaign, looking to raise the $25,000 needed to manufacture Chilton’s first run of skis. Gaines worked with a fellow startup out of Bozeman to produce the video. As Chilton Skis did with Blackstone LaunchPad at the University of Montana, so too did the video company – Triple Tree – find its start at the LaunchPad based out of Montana State University. The two college-driven startups are slowly gaining traction, and Gaines believes the resulting Triple Tree film will serve as the seed from which Chilton Skis gains a following. Chilton Skis and Triple Tree shot the film in what Gaines described as a marathon weekend. The filming was followed by a solid month of editing. Gaines said the need for a quality video played a central role in his vision for a successful fundraising campaign. The idea for a quality, locally sourced ski began with backcountry skiing. Gaines had friends who were avid skiers and the idea appealed to him. He began to design a prototype ski suited for the terrain and the results were well received. Gaines said a successful Kickstarter campaign would enable Chilton Skis to produce its first run of skis. Funding would also enable the company to purchase the needed equipment, rent the shop and buy the materials. The premier of the Triple Tree video featuring Chilton Skis takes place Friday, March 3, at 7 p.m. at Bad Goat Forest Products, located at 1301 Scott Street in Missoula.